I found this picture on the Huffington Post from a review of Jonas' appearance at the LA Opera. 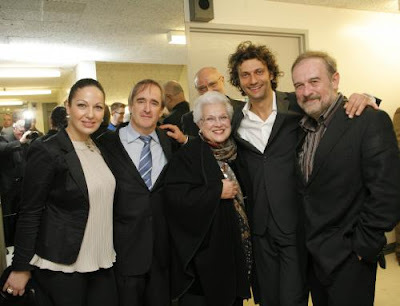 Photo by Robert Millard, from left: soprano Nino Machaidze, James Conlon, mezzo soprano Marilyn Horne, Kaufmann and Deutsch. It's nice to see Marilyn looking so well.